The coffee shop at the ITC Grand Central, Mumbai, is flooded with natural light. Having downed several cups of hot coffee to power through our Monday morning, and driven by the sole purpose of getting the perfect location in which to capture the styled plates that the chefs are about to create, we move to the hotel’s exclusive Indian restaurant, K&K that adjoins the fine-dining Chinese eatery, Shanghai Club. 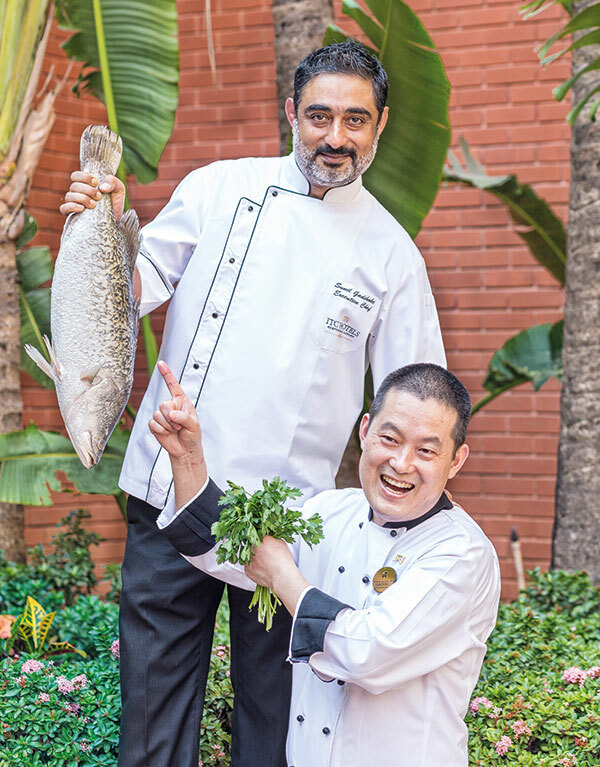 Perfect, I conclude silently, as the brains behind today’s creations — Chef Sunil Gadihoke (who heads the kitchen brigade at the luxury property) and Chef Yuanzhong Jia (who hails from Sichuan) — will be conjuring up culinary delights, one each from the two cuisines. 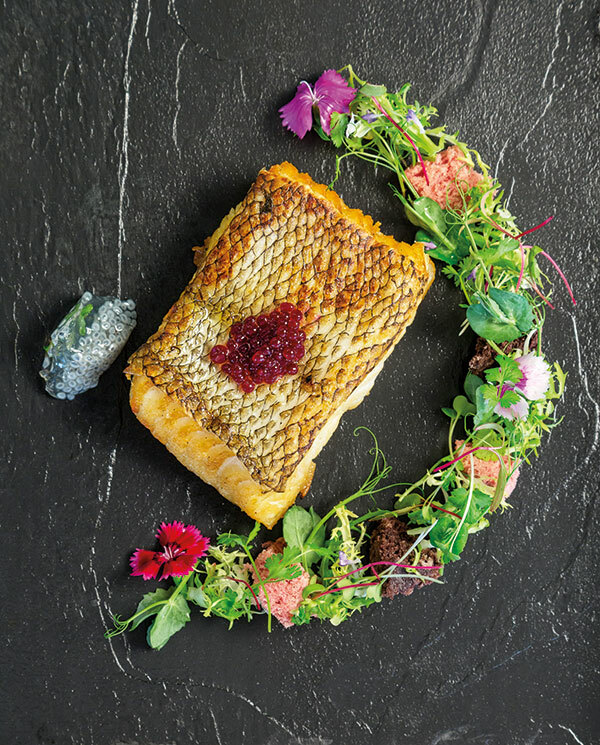 And the star components — sea bass and raspberries — are poised to take centre stage. Gadihoke and Jia are completely immersed in the activity, juggling their tasks of the day with elan. Other chefs, drawn to the action, walk in to give their inputs on frames and ingredients. Luckily, as the morning progresses, it disproves the age-old saying ‘too many cooks spoil the broth’. While the preparations gain in intensity, plates and platters are brought out for our approval. A huge sea bass makes its appearance — but this is followed by its swift disappearance from the plate. At the end of the day, while the chef rules over the kitchen, the guest is king! As Gadihoke rightly states, “Today, the customer is discerning and aware of global trends and cuisines. It means that we must remain contemporary in our techniques and keep moving at the right pace, both in terms of knowledge and skills.” And, as I walk out, contemplating the morning gone by, I feel that both of these have been amply in evidence today. For the sea bass Chilean sea bass steak, 180 gm; Salt, to taste; White pepper powder, to taste. For the ginger soya sauce Chopped ginger, 5 gm; Light soya, 10 ml; Dark soya, 5 ml; Aromat seasoning powder, 5 gm; Salt, to taste; White pepper powder, 5 gm; Sugar, 5 gm; Chinese wine, 10 ml; Corn flour, 10 gm. For the raspberry and spinach hand-made noodles Fresh raspberry juice, 40 ml; Spinach puree, 40 gm; Refined flour, 150 gm; Egg, 30 ml; Salt, a pinch. For the raspberry crisp Raspberry juice, 30 ml, Flour, 15 gm; Water, 50 ml; Oil, 10 ml. For the sea bass Marinate the sea bass with salt and white pepper. Cook at 100 degrees Celsius for 12 minutes in a steamer. Gently take out the sea bass and let it rest. For the ginger soya sauce In a wok, sauté finely chopped ginger, add soya sauce and water, and season. Add the corn flour to thicken the sauce. For the raspberry and spinach handmade noodles Mix the ingredients and make two kinds of dough — one with fresh raspberry juice and the other with spinach puree. Roll the dough into sheets with the help of corn flour and cut into thin strips. Boil both types of noodles separately for six to eight minutes. For the raspberry crisp Mix the ingredients in a bowl and strain into a bottle. On a flat pan, add oil and heat it to 150 degrees Celsius. Pour the batter over the oil and let it crisp up. Arrange all the pre-prepped ingredients on a plate and garnish with edible flowers. For the sea bass Chilean sea bass steak, 180 gm; Extra virgin olive oil, for slow poaching; Sea salt, to taste; lime juice, of 1 Italian lime. For the raspberry microwave sponge Melted clarified butter, 50 gm; Sugar, 30 gm; Flour, 60 gm; Baking powder, 5 gm; Raspberry puree, 10 ml; Egg, 1; Milk, 30 ml. For the caviar Algin, 3 gm; Calcic, 7 gm; Raspberry puree, 200 ml. For the basil seed jelly Soaked basil seeds, 15 gm; Coconut water, 200 ml; Rose petal, 1; Holy basil leaves, 10; Agar, 5 gm. For the sea-sand dust Bread crumbs, 30 gm; Balsamic vinegar, 10 ml. For the sea bass Marinate the fish with lime and sea salt and let it rest for 15 minutes. In a non-stick pan, pour the olive oil till half depth. On a very gentle fire cook the fish on both sides, starting skin side first for a crisp texture. For the raspberry microwave sponge Whisk the egg and mix with sugar. Fold in the flour, butter, baking powder, milk and raspberry puree and pour this mixture into a greased ramekin. Microwave it for 60 seconds. For the caviar Whisk the algin in the raspberry puree with a hand blender and leave aside for 24 hours. With the help of a syringe, drop the puree into a calcic bath. Gently remove the caviar that forms and wash in chilled water. Save aside in cold water, for use later. For the basil seed jelly Fold warm agar into the basil seed, rose petal and holy basil mixture. Dice and keep aside. For the sea-sand dust Mix the balsamic vinegar and bread crumbs and dehydrate in a salamander for a couple of minutes till they turn dry and become a sea-sand colour. Powder this in a mixer till it attains the desired texture. 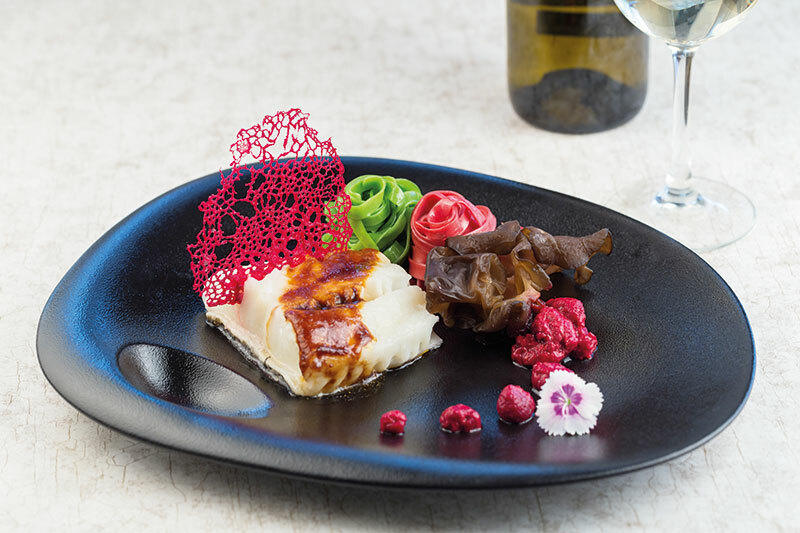 Arrange all the pre-prepared ingredients on a plate and garnish with microgreens and edible flowers.